I'm really eager to see you continue your sprite series, they have a cool look, keep going. You have a really great style with your sprite work. Those slimes are awesome. 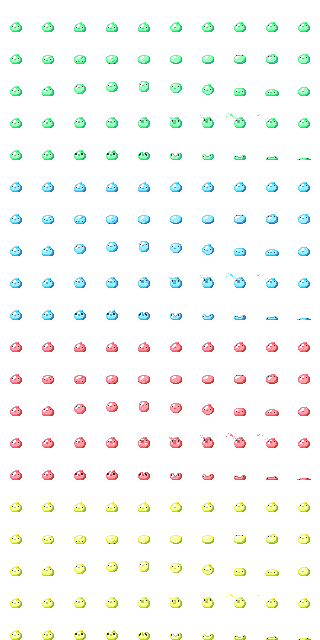 I've updated the slimes to be at 32x32 pixels rather than 16x16 and they now have twice the frames of animation. I didn't like the idea of these guys not being up to par with the other animated characters and monsters I've been making just because they're small so I fixed 'em up! Hi, is it fine if I use it recolored? I will include you in credits and post recolored version here of course. Thanks, I already have basic version ("goo bouncing" on itchio). But I feel like I will have to recolor everything before adding more levels and releasing on other platforms. I'd like to use this icon with my project! Thank you!